Last week one of Momo’s descriptors for Yuki was “hardworking”, and this week all Yuki does is prove how apt that descriptor is. Not only does she do all she can to make sure Momo passes final exams (though he ends up still having to take make-ups), she also cooks lunch for him. Indeed, her devotion for Momo has motivated Yuki to try to improve herself in all the home ec areas she’s weakest in. Norika is impressed, if still a bit weirded out by the way Yuki expresses her love. Even Rio can’t help but respect all the work Yuki is putting into becoming someone worthy of Momo…even if she really doesn’t have to go so far. Momo simply doesn’t seem to be putting in the same amount of effort to be worthy of Yuki, aside from trying to be seen by her as a strong and reliable man (and in this he often fails because she, and everyone else, merely sees him as cute). 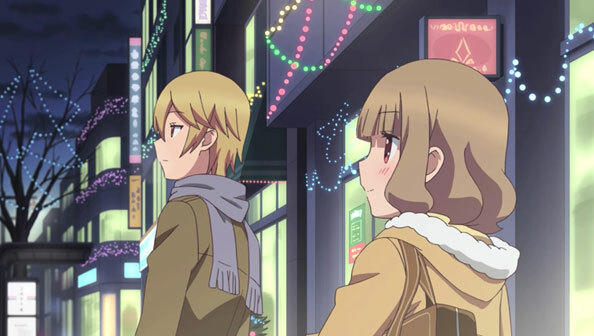 In the end, Yuki’s intense efforts result in her getting sick over the Chistmas holiday, but thanks to Norika, Momo ends up visiting her, and to his credit, he does all he really needs to do: be there. Yuki is over the moon by Momo’s presence, and when he worries he’s imposing, she insists he stick around, holding her hand until she drifts off to sleep. It’s a simple but lovely little scene that shows that sometimes it doesn’t really take much effort to fulfill the dreams of the one you love. Simply being by Yuki’s side is enough. The rest of Summer Break breezes by without any contact between Momo and Yuki after accidentally ending up so close together. 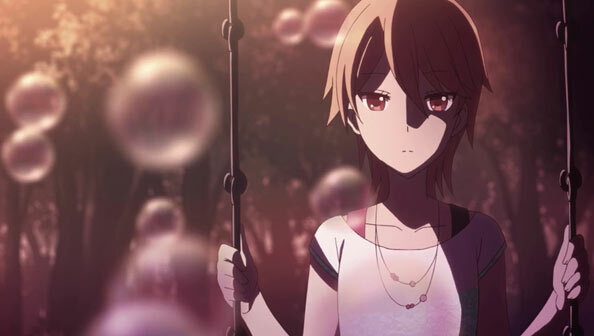 It wasn’t a matter of Yuki not liking it, but liking it too much and not being able to withstand any more. 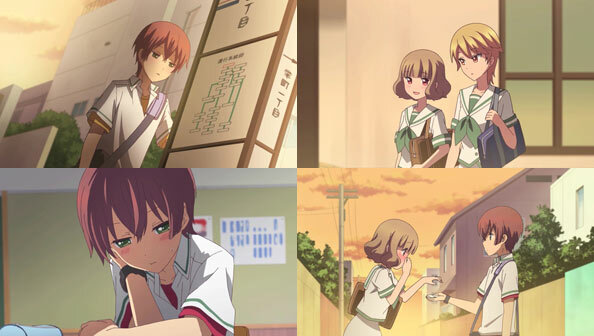 As a result, Momo is a little confused by their distance when the new semester arrives, but a nervous Yuki is later comforted by the fact that Momo not only worries about her, but is willing to call her to make sure everything’s okay. 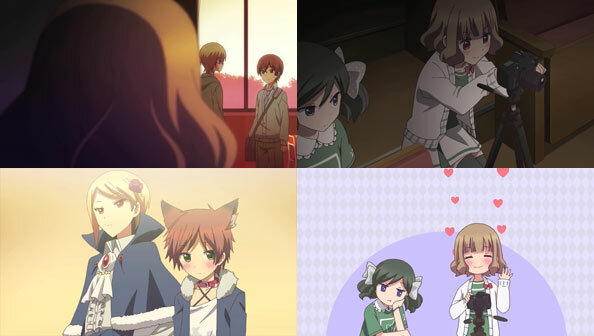 Norika and Sawaguchi have a nice sidebar wherein the latter notices Yuki’s stalking, but comes to Yuki’s friend instead of Yuki directly, showing a degree of tact and delicacy. Norika is impressed by this, but as easily as Sawaguchi was able to detect Yuki’s bizarre behavior, he has a much tougher time reading Norika, who I feel genuinely believes he is a nice guy, even if her vitriol-spewing gives him cause to doubt it. 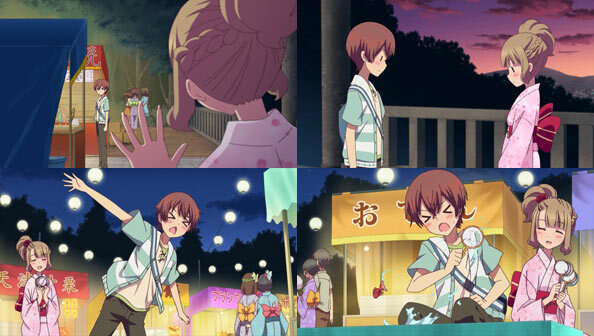 Momo invites Yuki to a date at an amusement park, and the two have a grand old time, eventually ending up at the haunted house (where Yuki wants to hang off of Momo’s arm). A fortuitous power outage gives them both far more than they bargained for when Yuki trips on Momo, falls on him, and her hair gets tangled on his sweater button. The house had legitimately made Yuki tremble in fear, so Momo’s correct and natural instinct is to hold and comfort her, which is what he does. Momo is surprised she’s more receptive to being held after running off and not being heard from the rest of the Summer, but due to the button entanglement they’re both in a situation of forced intimacy, and neither really has a problem with it. After they get entangled and Momo sees Yuki home, he crosses paths with Rio, who we know full well is jealous of Yuki, something she may only just be starting to realize when she gets to sit down, mend Momo’s sweater, and simply comes out and says things one could construe as critical of Momo and Yuki’s relationship. Specifically, Rio sees Momo keeping a distance from Yuki, putting more value in his absence (and the trinkets he discards, like his button) than his presence, since his presence is often so overwhelming. At the same time, she sees Rio looking at Momo but not really looking. 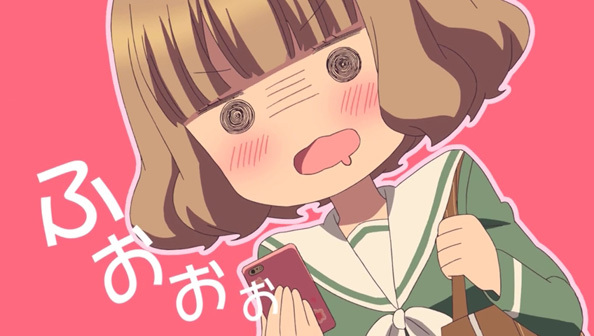 What she really sees, jealous googles or not, is that Momo and Yuki are still fumbling through the basics of romance. Like Rio herself, neither of them have the slightest clue what they’re doing, and continue to put up walls when things get too intense. But there’s every indication, especially taking into account the progress they’ve made thus far, that they’ll figure it out eventualy. It’s a pool episode…another opportunity for Yuki and Momo to get a little closer. 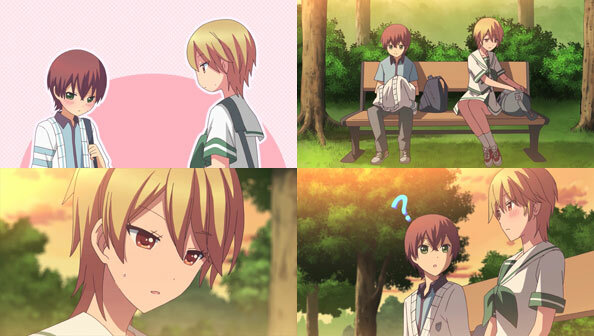 But after Norika inadvertently makes her feel weird about showing so much skin, Yuki covers up and sits alone. Momo thinks she’s caught his cold, but when she tells him that’s not the case, he starts blowing up a beach ball for them to play with. This unlocks Yuki’s obsessive side, as she’s so preoccupied with the fact she’s batting a ball of Momo’s exhaled breath that she breaks the cheap ball, treating it with far more reverence than Momo, who’s content to buy another. 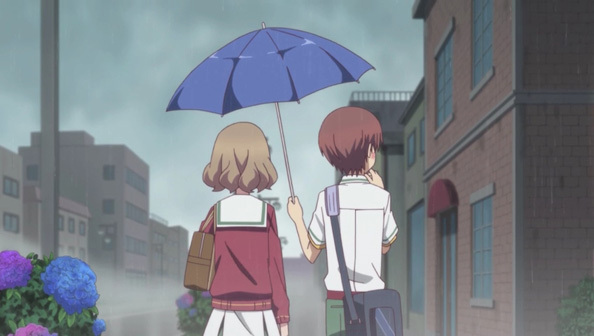 When Momo is directed by his friend to hold Yuki’s hand as he escorts her to the bus stop, Yuki overprepares by dousing her hand in sanitizer spray. There’s no need for her to act so deferential; he wants to hold her hand. More than that, he doesn’t want their day to end with her maturely saying goodbye as she boards the bus. 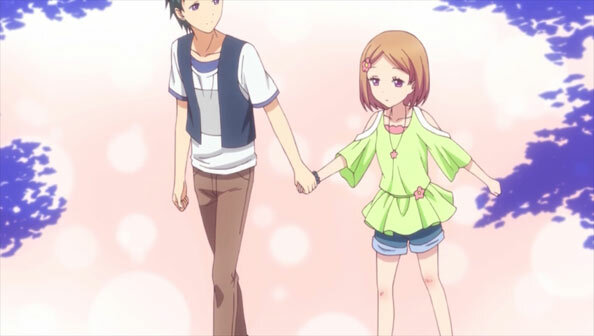 Instead, he grabs her hand and takes the lead, surprising even Yuki. Momo really wants Yuki to understand he’s not just a cute animal, but a man, and believes being more assertive is the key. The only thing is, Yuki is so into Momo, his attempts to get closer end up overwhelming her, to the point she’s involuntarily spinning in her swing until she’s dizzy and collapses in his arms; no doubt an ideal outcome for both of them. 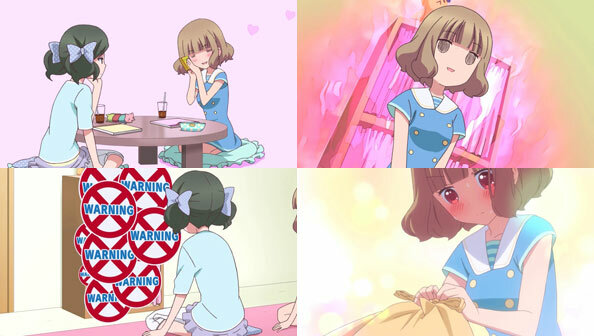 Later, while studying with Yuki, Norika discovers her hidden stash of gifts Momo has given her, but also an obscene amount of used items he has cast away. In effect, it’s a cabinet full of junk that Yuki is placing far too much importance on, so Norika walks out of the room returns with bags, and starts cleaning up. Even once the stuff is bagged with tight knots, Yuki still wants to get inside to retrieve her “treasures.” This kinda stuff in Momokuri walks a fine line, but the point is made that her love of Momo is so intense, sometimes she thinks she’s going crazy, an assertion Norika can’t argue with. Purging her stash, and letting the stuff that doesn’t matter go, are necessary steps to tempering what is right on the line of being an unhealthy obsession. Love the guy, not his refuse. Turns out Momo is coming down with a fever, so his friend texts Kuri with Momo’s phone and she comes, full of nervousness. The fact is, both Momo and Kuri are incredibly timid when it comes to…one another. Krui constantly hides her more intense thoughts towards him (which we’re privy to), while Kuri…does pretty much the same thing. They cannot deny how much their hearts pound when around one another, but as we see, Momo isn’t able to quite pull the trigger, faking a feverish collapse rather than go through a first kiss that Kuri definitely would have accepted. Still, as Chu2Koi! effectively demonstrated, every couple has it’s pace, and while Momo and Kuri’s pace may be slow for some, it shouldn’t be construed as anything other than the only pace they should be taking things: a pace they’re both comfortable with. They both love each other, so progress will be made given enough time. Take their first-name-basis: Kuri has already started mixing in some “Shinya-kun’s”, and Momo decides in bed that he truly wants to start calling Kuri “Yuki”. They’re both still very embarrassed to do it, but the fact they both do it, and share in that embarrassment, is a step in the right direction. The fact that hearing one another’s first names spoken by the one they love also serves as motivation to continue taking steps forward. 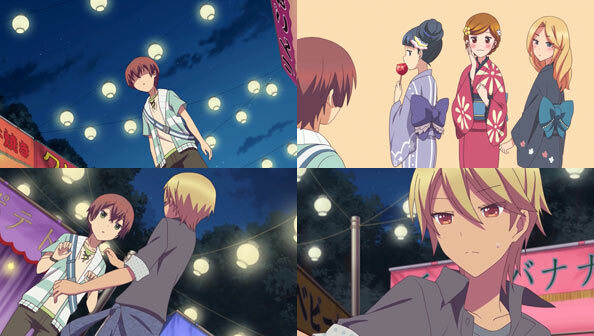 Another week, another familiar rom-com scenario: the Summer Festival. 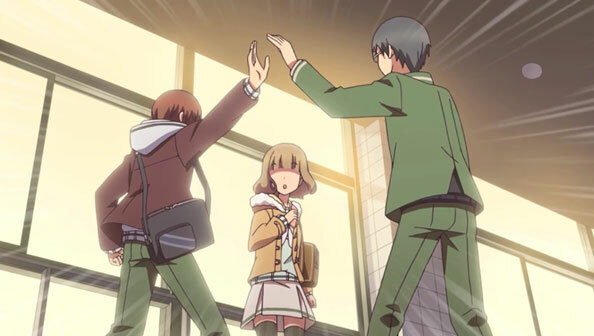 While Momokuri’s didn’t come close to the heights of, say, ReLIFE’s festival, it was still Momokuri’s best episode to date, because it progressed, and characters came in contact with one another, so naturally and effortlessly. 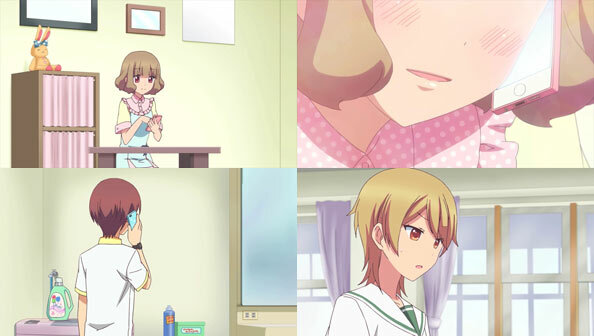 Not only was it a fine bit of slice-of-life, it also developed Rio’s relationship with Yuki. 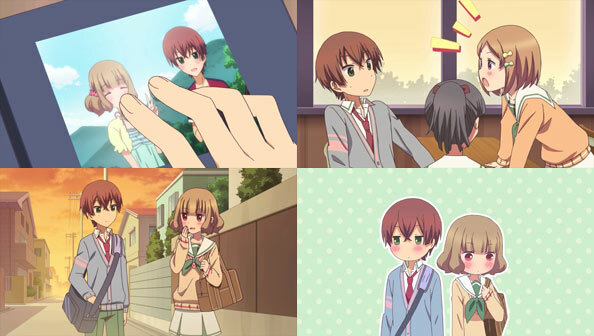 Momo and Yuki are having a fine time as a couple at the festival until they become separated, and Momo’s phone dies. 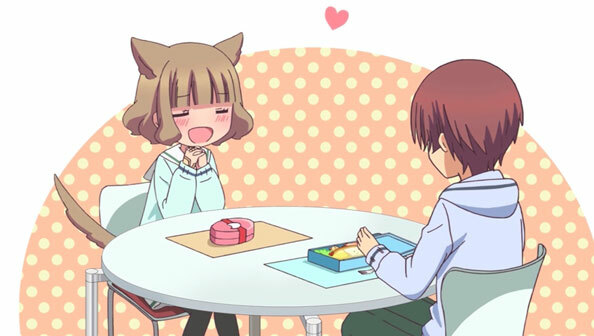 Momokuri subverts the typical instance of a cute girl left alone falling prey to some wolves. In this case, the wolves are older women, and it’s diminutive-for-his-age Momo who is the prey. Not only that, it’s “Prince” Rio who swoops in to save him from the “panthers”—more androgynous than ever due to her tan and boy’s clothes (provided so she could serve as protection for Ikue and Yuzuki. Despite looking like most like a boy (and a delinquent at that), Momo remarks how he’d rather see Rio in a yukata. Rio has spent much of her most recent years enduring those who say she could pass a a boy, so she’s heartened by Momo treating her like the girl she is. Rio heads off on her own to look for Yuki, because a part of her wants to be one-on-one with her. It’s just as good, because when being with Yuki, Rio learns a little more about her rival-in-love, and determines maybe she’s not as weird as she thought. Indeed, she helps Yuki come to grips with feelings she’s not able to understand all on her own. Like Momo and Yuki, she too was a bit lost early this week. But by the end, her stated desire for Momo to be happy above all else is evidence enough for Yuki that what Rio has isn’t just a like for someone, but love. Of course, Yuki isn’t aware that it’s Momo Rio likes. I doubt she’ll ever find out, either; this isn’t a drama, after all! After an exhaustive search for the perfect swimsuit (driving Norika half-insane), Kuri joins Momo and the rest of their circles of friends for BBQ. And that’s really all this episode is: a nice, pleasant, relaxing slice-of-life BBQ. Sure, it draws more attention to one of the other couples, which is non-romantic in nature and between cousins, with the guy somewhat worried about the girl being too close for too long. Ya know, ’cause their respective parents are siblings, and all. Moving along, the one person who probably relaxes the least (other than Momo) is Rio, who came in part to try to make some kind of tangible progress on the Momo front. Alas, as much as she stares into his soul, Momo considers her naught but a friend, if he considers her at all. Kuri brings her A-game to the BBQ, and even though it’s too cold to swim, Kuri wants to see Momo’s skin so bad she gets it into her head to show him hers, lifting up her skirt to reveal her red swimsuit. Momo has nothing but compliments for said suit, but makes it clear the compliments he’s making are directed at the suit and not anything else. Bold “reveals” aside, these two can still awfully timid around one another, suggesting the next steps in their courtship won’t come quickly or easily. Rio’s long-distance admiration of Momo progresses when their eyes meet and Momo reaches out in friendship, seeing as how her two best friends know his two best friends. Momo also inadvertantly sets Rio’s heart aflutter when he compliments her height and figure. Of course, Kuri also knows Rio, and sees her as a potential ally in her quest to document Momo in every possible condition, such as, say, when he’s in the pool for P.E. Rio feels a hint of kinship with Kuri, but Kuri’s so damn much that it still weirds Rio out in a way Norika is clearly more used to. 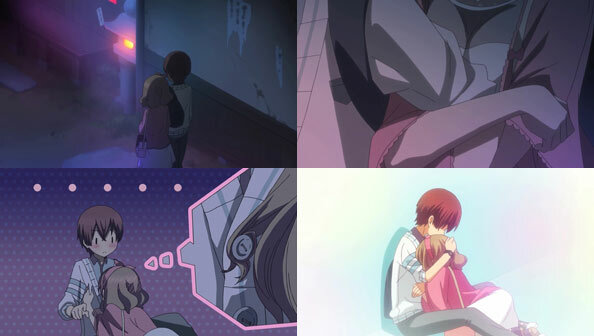 Kuri’s desire to meet with Rio meant not walking home with Momo after a long time of doing just that (and only that), so when Momo sees Kuri with Rio, he gets jealous, and gets even more somber when she doesn’t walk with him to school. Obviously, dude has no reason to worry, since he was the whole reason Kuri met with Rio to begin with, and when he brings up how he’s felt down while they’ve been apart, it gives Momo a nosebleed he quickly and expertly attends to. 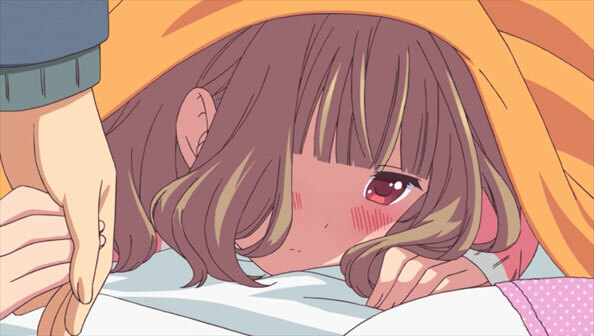 Hearing his lower voice, and his request she not call him feminine, Kuri starts to think of Momo as more than just cute, but also a boy, though she’s still not quite sure what to do about it. After a kick from Norika, she commits to asking him out on a proper date to the beach. Before she can, Momo steals a march on her, inviting her to a BBQ, along with all of their mutual friends. They both revel in the fact they’re on the phone with one another, to the point Kuri thinks out loud, embarrassing both of them while at the same time being happy the words were said. 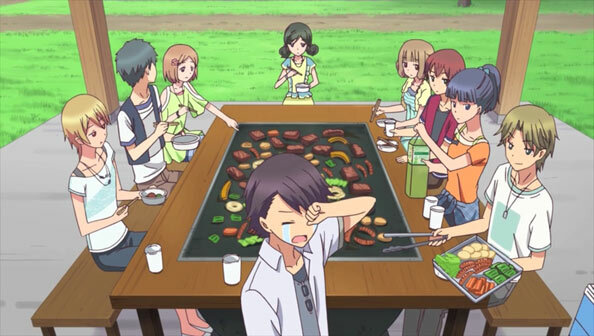 These two episodes felt a lot more like a single, standard-length one, and with the BBQ not happening until next week, Momokuri has gotten very serialized. As long as things don’t get too complicated or dramatic…that’s what Orange is for! I like Momokuri because it’s simple, pleasant, and light. Sakaki Rio, Yuki’s tall, cool, athletic new rival, probably thinks the world is out of alignment, and she simply needs to click it back into a place where she, not Yuki, is by Momo’s side, “protecting his smile”, as anime characters love to do. That Yuki simply slipped into Momo’s good graces with her Poodle-Maltese-esque cuteness and outwardly easygoing nature; but she doesn’t deserve Momo; not really. He’s Rio’s small, cute animal to protect. But at the start of the episode, she’s at a distinct disadvantage. She’s in the supermarket. Yuki ends up in Momo’s room, then bed, then enjoys dinner with him. Definite FOMO vibes coming off Rio. It wasn’t always that way. She joined the tennis club because Momo thought she’d look cool playing. Then he quit, and she got stuck practicing with the older girls that craved her athletic prowess. She lost her “in” with him, though she’s still in the same class as him and accepts his offer of ice cream in exchange for her study cards. 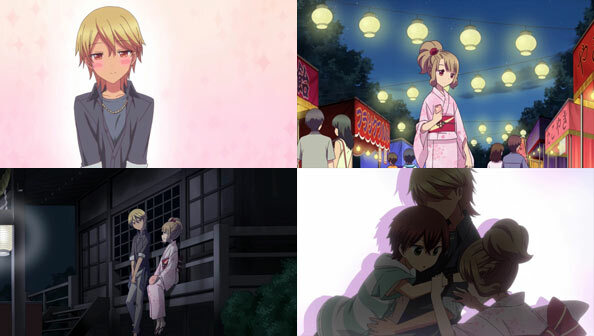 But it’s clear Momo doesn’t see her at all the way Rio sees him, which is more how he sees Yuki. To Momo, she’s just…a friend. Whereas Rio’s effort to get closer to Momo (thru tennis) fizzled out, Yuki has gotten to where she is through relentless effort and persistence, without ever exposing too much of her perv-ier side to Momo. More to the point, he’s all but blind to that side of her-like assuming she was feeling ill when he found her in his bed. What’s amusing about these two is that Momo is often worried that he’s thinking impure thoughts or being pervy and tries to check himself, while Yuki leaps into that arena with such gusto, she often needs her friend to pull her out, by, say, tossing out Momo’s used straws. When she inevitably gets found out by Rio, Rio doesn’t turn it into leverage, because she can’t, not without revealing her own hand to Momo (or worse, coming off as mean or vindictive). She’s also clearly a little afraid of Momo’s intense observation and intel-gathering methods. 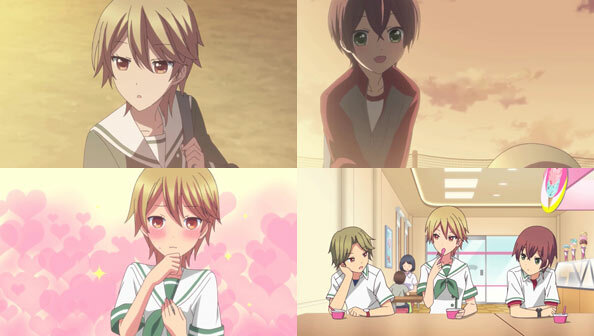 But Rio also knows that there’s more to Yuki than she thought …much more, though not all of it necessarily good. Yuki is right that Rio understands how she feels about the addictively-cute Momo, but the sheer intensity of Yuki’s obsession overpowers any resultant shame. Rio just isn’t wired that way, but they both like Momo, so it will be interesting to see how she deals. 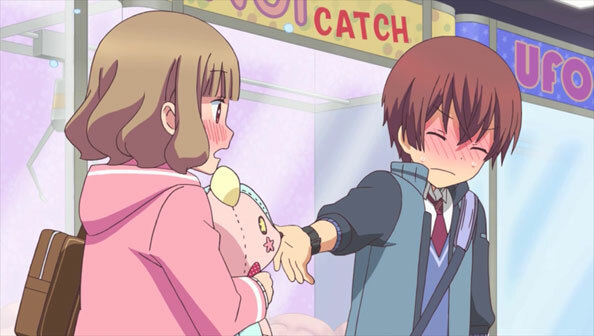 Momokuri sticks to is tried-and-true formula of getting comedy out of the fact that Momo isn’t aware of how head-over-heels infatuated with him Yuki actually is. Dialogue cuts to her saying outrageous things that are true to her feelings, but those responses are only imagined. It creates a nice romantic tension, especially considering Yuki is just as oblivious to the fact that Momo is actually really into her too, just not in the same stalker-y way. He even chokes down black coffee to show how mature he is, a ruse Yuki sees right through but appreciates Momo doing it nonetheless. You’d think someone so obsessed with Momo would exert a good deal of energy keeping him away from other girls, but to my (and Norika’s) surprise, she couldn’t care less that the girls in his class are all over him, even on his birthday. It just means more opportunities for her to snap pics of his adorable expressions. 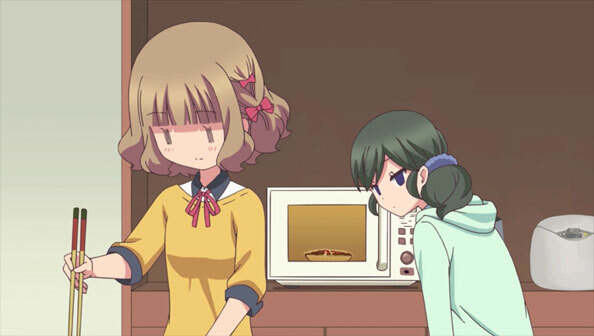 Yuki’s gift for Momo is a homemade cheesecake, but the show doesn’t make a big deal about her being good at baking; she just followed the recipe and it turned out…until she hit a pole and dropped it. Momo ends up giving himself a gift that doubles as a gift for Yuki: a simple holding of hands. He saw the opportunity and took the initiative. 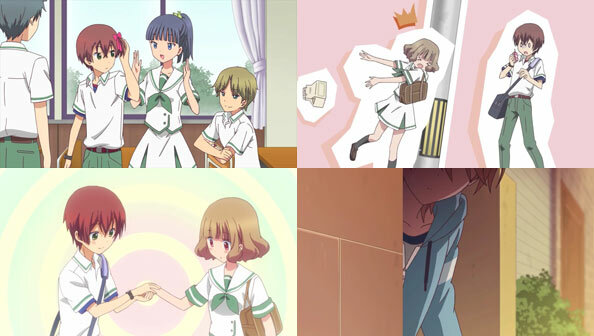 Episode four is all about a study session that Yuki arranges with friends of Momo and Norika. Her motives are twofold: help Momo pass exams so she won’t lose him for two weeks of their Summer to extra classes; and the opportunity to visit his house, see his bed, pillow, air, etc. Again Momo edits her thoughts when responding to one of Momo’s friends when they ask why she likes Momo. Instead of saying his a godlike being, she merely says he’s cute; something his friends agree on, becaue he’s so wee. The study session is an opportunity for Yuki to serve her cheesecake for Momo, and for the two to flirt in the kitchen (provoking a little light ribbing from his pals in the next room). During the studying, Momo notices one of his friends has grown pretty friendly with Yuki; while she’s not the nervous type, he apparently is. The session goes well into the night, so the girls volunteer to head to the supermarket to buy stuff to make dinner. 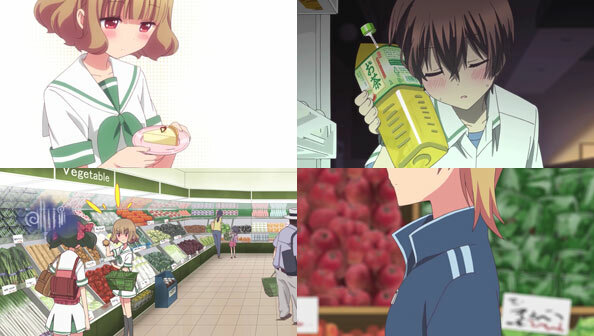 There, we see the short-haired girl int he track suit once more; this time near Yuki by coincidence. 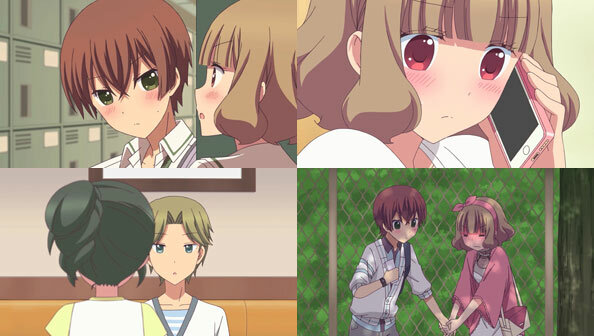 Momokuri is sweet, funny, and uncomplicated, making it eminently watchable. Will the introduction of a new girl ruin that? I hope not. 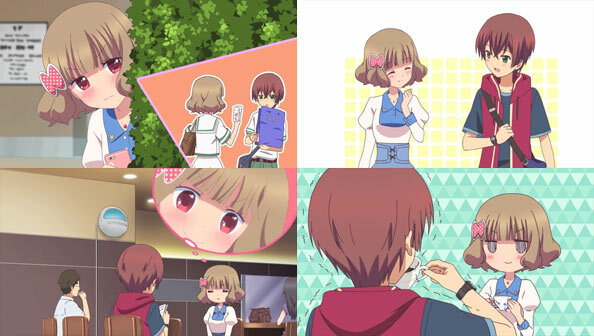 After obsessively amassing 100 photos of her crush Momo, Kurihara Yuki confesses to him and he agrees to go out with her. She must struggle to hide how head-over-heels she is for him, while still crafting ways to get closer. 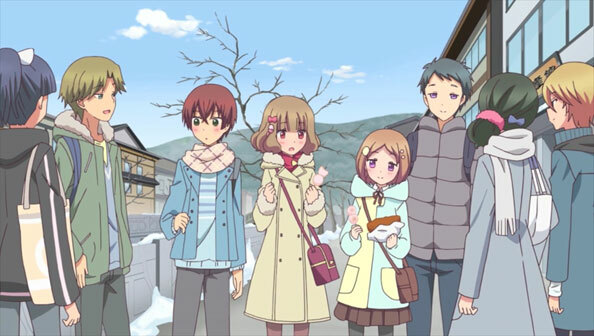 Momokuri is harmless lighthearted rom-com; the equivalent of Anne Happy or Sansha Sanyou, only with a romance at its core instead of a group of girlfriends. It also owes a bit to Kare Kano, in that Inner Yuki is a lot wilder than the one she usually shows the world (her patient friend Norika excepted). 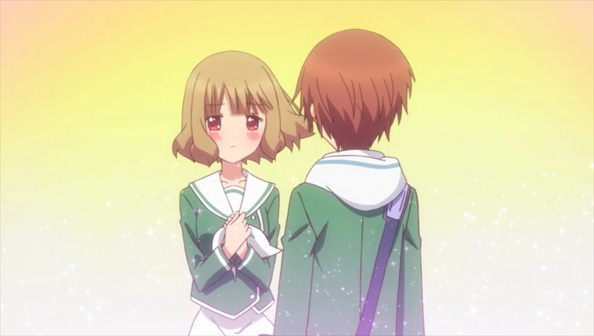 Anyway, I like shows that get the confession over with quickly, and Momokuri definitely does that. I also appreciate that this isn’t one-sided, but mutual affection; these two are mostly on the same wavelength; it’s just a matter of intel (Yuki has it all on Momo; Momo barely knows Yuki) and level (Yuki stalks Momo, but not vice versa). This show originally aired as an ONA/web series, but I never caught it. It’s episodes are also half-length, which means each week will be a two-for-one deal, which I can get on board with. Kakuma Ai (Julis) has a lot of fun with her voice role, while Okamoto Nobuhiko (Okamura Rin) mostly avoids his trademark shrillness. There’s nothing particularly special about this show, but it was pleasant and easy to watch, so it gets a place on my “feel-good” list at this early stage of the Summer season.